A man convicted of an attempt to kill George W. Bush has converted to Islam in a Georgian prison. Tbilisi resident Vladimir Arutyunian, who is an ethnic Armenian, has been serving a life sentence in Georgia since 2006, after being convicted of an attempt to assassinate Georgian President Mikhail Saakashvili and former US President George W. Bush, as well as the murder of a policeman. His lawyer, Gela Nikolaishvili, said that Arutyunian is currently in a normal healthy condition. "While in prison, he has converted to Islam, grown a beard and learnt the Arabic language," Nikolaishvili said. Arutyunian converted to Islam from the Armenian Apostolic Church. This is his second, and this time successful, attempt at conversion. 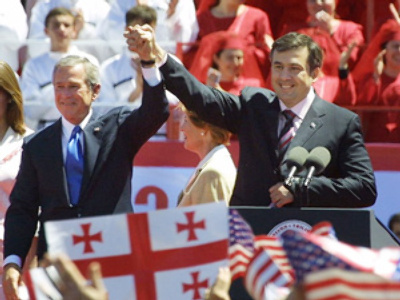 Back in May 10, 2005, Arutyunian threw a hand grenade wrapped in a handkerchief toward the podium from which Bush was speaking during a rally that brought together more than 10,000 people on Liberty Square in Georgia's capital. Saakashvili and others were seated behind the American leader. The grenade never detonated. Arutyunian escaped, but was arrested two months later, killing one of the policemen arresting him in the process. He was convicted in January 2006. According to his lawyer, Arutyunian applied to the European Court of Human Rights to enable him to appeal his sentence with a Georgian court. "The essence of Arutyunian's request is that he wishes to appeal for a revision of the case, but under Georgian law, he had the right to do so only within six months of his sentence being passed. This was not done for several reasons. These included Arutyunian's health condition and the fact that he had no independent lawyer at the time," Nikolaishvili said.